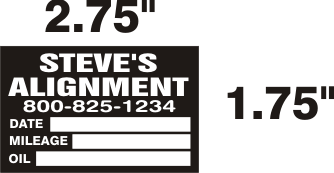 * 2.75" X 1.75" screen printed permanent white ink on clear removable vinyl. glass when replaced with new decal. * Special White ink has a matt surface receptive to writing with ball point or flair pen. * Oil can be wiped off decal with alcohol without damaging decal. * $140 for the first thousand (14¢ each) $45 per additional thousand (4.5¢ each).